Not Your Regular Zenescope Fare. E.V.I.L. Heroes Delivers Destruction July 2016! HORSHAM, PENNSYLVANIA— As of late, Zenescope Entertainment has been rolling out a variety of titles that one might not associate with the popular publisher. A few weeks ago Zenescope released their Aliens vs Zombies trade paperback and they are nearing completion of their Escape from Monster Island series. Zenescope is also past the halfway point for their new urban legend horror title, Satan’s Hollow. This week is the unveiling of Death Force, a powerful revenge tale. July holds the most talked-about title of the lot. A new foray for the Philadelphia-based publisher, E.V.I.L. Heroes is the recounting of humankind being enslaved by Superheroes. Will mankind survive and remain strong enough to challenge their self-appointed masters? Or will we be pushed closer to extinction? The E.V.I.L. 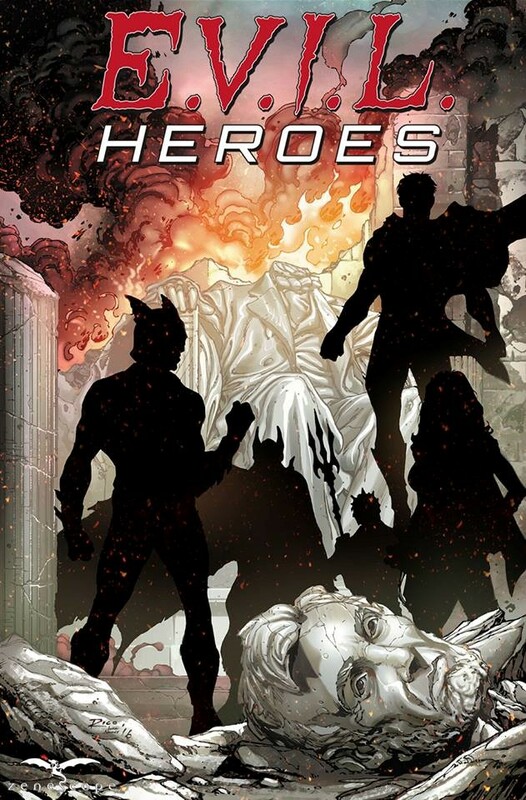 Heroes creative team features Zenescope co-founder and writer Joe Brusha (Satan’s Hollow & Realm War), artist Eric J (Grimm Tales of Terror, Fly, & Rex Mundi), and colorist Marco Lesko (Grimm Tales of Terror & Deus Ex: Children’s Crusade).